There are already two public mining pools available – Siamining (Pay Per Share) and Sia Nanopool (PPLNS) that you might want to check out. There are also a couple of different miners, but the best one for the moment seems to be the Siacoin Go pool miner that uses OpenCL, but works on both ADM and Nvidia GPUs. Do note that what makes Siacoin even more attractive not just to mine and sell your coins, but to keep them is that there is a decentralized storage service that actual already relies on these crypto tokens to operate. 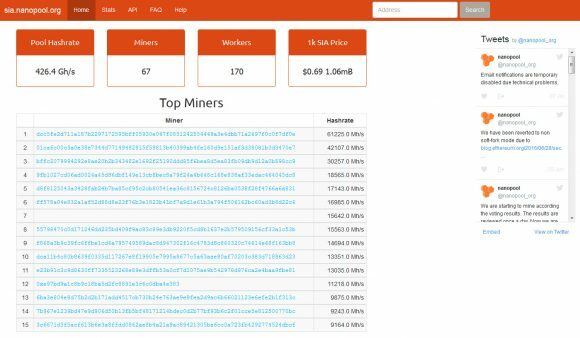 A few days ago we’ve covered the beta SIA pool from Nanopool, and now there is a second more interesting SIacoin mining pool open for public already available called Siamining. Nanopool is still in beta and apparently has some delays with payments, along with high minimum limits and uses PPLNS payment system, while the Siamining pool does seem to be out of beta already and offers more interesting terms, especially for smaller miners. The Siamining Siacoin pool uses a PPS (Pay Per Share) payment system with a slightly higher fee of 3% (to cover for the higher risk for the pool) and does payments every 6 hours. So no need to wait for a very high minimum balance (2000 SC minimum) or to wait for block confirmations before you get your SC payments sent to you, there is also a Long Polling support to minimize stale shares. We have been testing the pool for about a day already and it does seem to be working quite well already, so we do recommend that you check it out, especially for smaller miners. 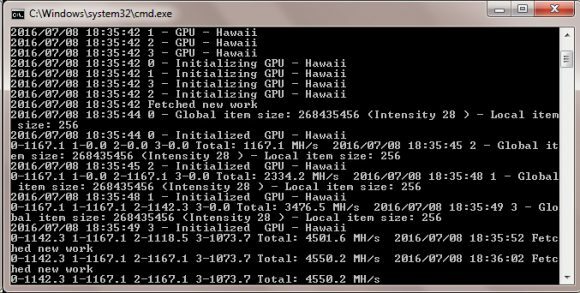 Meanwhile we have also done some benchmarks using the Siacoin Go Pool miner (source) that uses OpenCL for mining SC on different AMD and Nvidia GPUs (the miner supports mining on Nvidia using OpenCL) and you can fidn the results below. Do note that Nvidia is generally slower than AMD in terms of performance with OpenCL, however the new Pascal Nvidia GPUs such as GTX 1070 and GTX 1080 manage to do quite well in terms of hashrate. When you factor in the very good profitability mining Siacoin it is worth checking it out, especially if you are wondering shoudl you continue mining Ethereum with the current low exchange rate and high difficulty when there are already some good alternatives such as SIA. Alternatively you can go for dual mining Ethereum and Siacoin using the latest Claymore Dual Miner with ETH in the main focus and SC as a secondary crypto coin to fully utilize the resources of the GPU you are using. Just a reminder that the dual miner is only for AMD GPUs, so for Nvidia GPUs you still need to go for the SIA Go miner that you can download below (64-bit binary for Windows). A word of warning, the Siacoin miner is pretty heavy for the GPU, so be careful with the temperatures and power usage if your focus was lately on mining Ethereum that does not stress the GPU that much unlike other algorithms. The Siacoin Go Pool miner easily hits the TDP limits of the GPU while mining, so make sure your video cards are cool and that your power supply can handle the load. Siacoin (SC) has been picking up recently and there have been talks about privet mining pools available, but the good news is that you can already GPU mine the SIA crypto tokens that are powering a decentralized storage network in an open pool. The open Siacoin mining pool already available is sia.nanopool.org and you can join it and start mining in no time. The pool does not need a registration, all you need to have is a wallet address – generate one with a SIA local wallet or use an exchange generated wallet from Poloniex or Yunbi. You can download the GPU miner for Siacoin written in in Go for pool mining (source) compiled and ready to be used from the link below (64-bit release for Windows) or use the latest Claymore Dual Miner that brings support for Dual Mining Ethereum along with Decred or Siacoin as a second coin (previously only Decred was available for dual mining). The SIA Nanopool pool uses PPLNS payout scheme, has a fee of 2%, executes payouts once a day with a minimum payout currently set at 5000 Siacoins. Out test with the Siacoin Go miner for Siacoin shows about 1116 MHS as a hashrate for a single Radeon R9 290X GPU without overclocking, so you can have that number as a reference. The miner also works on Nvidia GPUs (it is still using OpenCL, not CUDA), as a reference number you can expect to get about 803 MHS from a GTX 970, do note however that for Nvidia-based mining rigs the go miner is the only choice as the Claymore dual miner is only for AMD GPUs. If you want to focus on mining Ethereum and mine Siacoin as a secondary coin and have AMD GPU mining rigs, then you can also try the latest Claymore dual miner version 5.0 that now gives you the choice for mine Decred or Siacoin besides Ethereum. Please report your hashrate and success in running the miner on different hardware, both AMD and Nvidia-based GPUs, in the comments below. should you decide to try mining Siacoin.